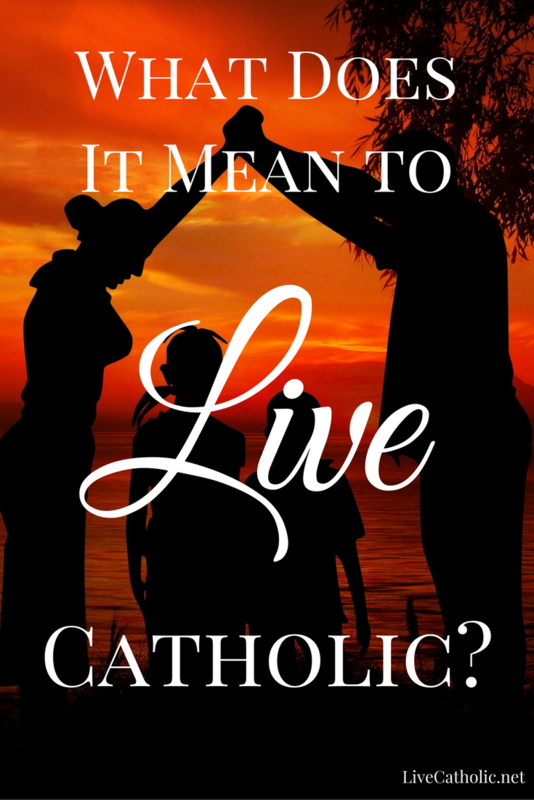 What Does It Mean To Live Catholic? 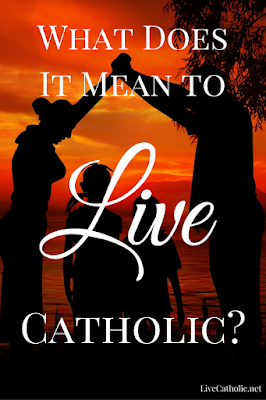 What does it mean to be a LIVE Catholic? It means we are not afraid to live life abundantly! To drink in the beauty of life, family, friends and the world. We are not afraid to explore the wonders of Christ. We have Hope! Hope for a better life in Christ, and most importantly the Hope of being with Christ on the “other side.” Whether we are new Catholics, “Reverts”, members of the life-long faithful, or those just considering Catholicism, we all can live life in the joy of Christ. Too many Catholics think religion is dour, depressing – what grandmothers and old men do. They have the impression that to be a saint is to be boring and painful. Long hours on their knees wearing hairshirts. But holiness is not about hairshirts – it is about union with God. An aliveness we can not only dream about but actually attain. A great adventure waiting for us that we only have to open ourselves to. And yes, this means YOU TOO! Saints are truly the most joyful people around. We may not know many – if any – but when you meet one you can sense it immediately. They radiate love, goodness and truth. Sure it is not all fun and games. Life is not like that. But the joy in Christ we experience here on earth is but a taste of the joy to come. True Catholics don’t spend their time complaining about how unfair the Church is, or how they are not getting their fair share, or how so-and-so said an unthinking word. True Catholics realize that it is all about their relationship with Christ, not about rules. The rules are there to give us a framework to build on, to go beyond. A starting point. True Catholics are alive in the Faith. They take a journey every day with Christ. They never stop learning. They are never afraid Christ will abandon them. They suffer hardships, pain and disappointments with faith and trust that the Lord will give them the strength and help to persevere. To get to this point – joy in the Lord amidst life’s struggles – is itself a journey. We have so much to learn and experience. There is a depth to Catholicism that is unfathomable to us. We could spend our entire lives with our nose in book after book, website after website, and never even scratch the surface of the knowledge of Christ held within the Church. In another way though, knowledge of Christ is profoundly simple. Even small children and the uneducated understand it, and in many ways, better than anyone. They have a deep understanding of who God is and what he wants from our lives. Simple people have far less in their way to Christ than we may have. Of course, we cannot ignore problems when they happen, in the Church or in life, but we cannot let them spoil our joy. We cannot allow problems to penetrate and sour our relationship with the Church and with Christ. We also need to let our joy spread. An alive Catholic opens his or her heart to the world. They have compassion for those in the world – be it a starving child, or a person whose heart is a stone. We need to let the Holy Spirit flow through us to spread the Kingdom of Christ. We need to do this even when confronted by hostile territory and the “snakes” of the world. Our mission is to be in Christ and spread Christ in spite of problems or problem people – like family, or co-workers, or even other Catholics. The most important thing I can possibly say to you is that YOU, with God’s grace, can do this. You too can be a Live Catholic. Someone who radiates joy and has a deep relationship with God. If you trust God, open your heart to him, and seek him with all your heart you will find him. I'm not Catholic but I want to start living according to the Catholic faith because I believe in it. I've read the Catechism and accept all that I've read. I know I should convert but the classes are never the right time due to my work. Is it ok to live as a Catholic, even though I haven't been baptized? Thankfully I have time to go to Mass several times a week and pray. I'm sorry for not replying sooner but I was out of town on a pilgrimage. Jesus wants us to be baptized, and to receive all the graces from the sacraments. He specifically instructed the Apostles to go out and baptize. You should definitely talk to a priest about perhaps receiving private instruction, or checking with other neighboring parishes for times for RCIA that may be different. Even contact the diocese. Don't take no for an answer. There WILL BE a solution. I'm so happy for you, and for the Church, that you have been listening to the prompting of the Holy Spirit. God Bless!